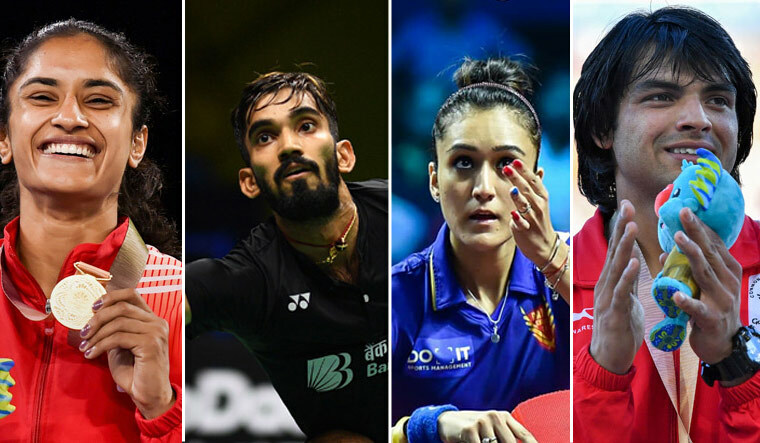 With action set to begin at the 18th Asian Games in Jakarta and Palembang this weekend, here's a look at prominent Indian athletes, who will be medal contenders at the biggest multi-sport event after the Olympics. Bajrang Punia: The 24-year-old grappler from Haryana, a silver medallist at the 2014 Incheon edition of the Asian Games, is in tremendous form and will be a firm favourite in 65kg freestyle event. He has already won three tournaments this year. Bajrang began with a gold in Gold Coast Commonwealth Games and followed it up with titles at Tbilisi Grand Prix (Georgia) and Yasar Dogu International (Istanbul). Sushil Kumar: One of India's most successful Olympians, Sushil is under pressure to perform after a flop show at Tbilisi Grand Prix. The defeat in Georgia, his first in four years, has already resulted in people questioning his exemption from Asiad trials. The two-time Olympic medallist would look to show that he still is force to reckon with. Vinesh Phogat: Vinesh is competing with lot of vigour after making a comeback from a heart-breaking leg injury, suffered during the Rio Olympic Games. The ease with which she won the Commonwealth Games gold and then the Grand Prix of Spain in Madrid, Vinesh will also be a strong medal contender in the 50kg category. P.V. Sindhu: A lot rests on the shoulders of World Championship silver-medallist P.V. Sindhu, but she needs to forget her defeat to Carolina Marin in Nanjing. Having lost four major finals, Sindhu would be keen to break the jinx. Saina Nehwal: The woman who revolutionised the sport in India with her exploits has not been consistent enough, of late. The performance has gone up and down and the way she was blown away by Carolina Marin in at the Worlds was not a great sign. However, with her caliber and experience, she can never be ruled out. K. Srikanth: The CWG silver-medallist will be the lone Indian hope in the men's singles. Srikanth briefly held the number one rank this April, and will face stiff challenge from the Chinese, Indonesian and Japanese shuttlers. Manu Bhaker: No Indian shooter has shown more promise than the Haryana school-going 16-year-old. With her gold medal winning performance at the ISSF World Cup, Manu became the youngest Indian to achieve the feat. She also shot down the gold at the CWG and will be a strong contender in the 10m air pistol event. Hima Das: The rise of the 20-year-old from a village in Assam has been phenomenal in the last few months. After her sixth-place finish at the Gold Coast CWG with a timing of 51.32, she became the first Indian to win a gold at a global IAAF track and field event with a timing of 51.46s in 400m. Also, her CWG timing is better than Bahrain's Kemi Adekoya (51.59), the gold medal winner at 2014 Incheon Games. Neeraj Chopra: The young javelin thrower's status in the Indian contingent was underlined when he was chosen as the flag-bearer. The 2016 Under-20 world champion has enjoyed a meteoric rise. After winning gold at CWG with a throw of 86.47m, he bettered his personal best by clearing a distance of 87.43 at the IAAF Diamond League in Doha. He has won three gold medals in last four events. Seema Punia: In the last leg of her career, the 35-year-old discus thrower Seema Punia would look to defend her title and add yet another medal to her tally. The Chinese will be her main opponents. Dutee Chand: After reclaiming her place on the track, the sprinter is all fired up to complete some unfinished business. After winning her gender case at CAS, the 22-year-old from Odisha bettered her own national record by clocking 11.29s in semifinals. Dutee won gold with a timing of 11.32s. Rohan Bopanna and Divij Sharan: If the veteran pro from Bengaluru has overcome a recent shoulder issue and could play to his potential, Bopanna will be a contender along with very impressive Divij in men's doubles. Ramkumar Ramanathan: In the absence of top singles player Yuki Bhambri, the Chennai-player will carry India's hopes. His run to the final of the ATP Newport event is a testimony that he is capable of pulling off big wins. He beat top-10 player Dominic Thiem last year and needs self-belief to return with a medal. Vikas Krishnan: A winner of two Asian Games medals, Vikas Krishan will be India's strongest contender for a medal in Jakarta. He has already won gold this year at the Gold Coast CWG in the 75kg category. Shiva Thapa: Success has eluded Shiva at multi-disciplinary events and the boxer from Guwahati would be desperate to better his record when he takes the ring in the men's 60kg category. He has a good record at the Asian Championships to draw confidence from, having claimed three successive medals. Sonia Lather: The World Championship silver-medallist will lead a three-member Indian women's team in the absence of MC Mary Kom, who pulled out to focus on the World Championship. Sonia will compete in the 57kg. Dipa Karmakar: After missing out on CWG due to a knee injury, Dipa returned to competitions at the World Challenge Cup in Mersin, Turkey and won a gold. The Rio Olympics fourth-place finisher is tipped to be India's best medal bet in Jakarta. Manika Batra: Her gold medal winning performance at the Gold Coast was arguably the most inspiring performance at 2018 CWG for India. Although the level of competition in Jakarta will be altogether different, Manika is expected to give a strong fight to her rivals.